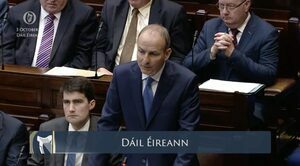 Fianna Fáil leader Mícheál Martin raised the housing crisis and asked Taoiseach Leo Varadkar if he could explain “the absence of delivery [of housing] across the board” and if he accepted Ireland was in an “emergency”. 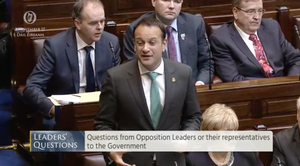 Mr Varadkar said he’s already on record as saying there’s an emergency and said he knows people across Ireland are frustrated with the pace of delivery of houses and that he’s frustrated, too. He said he could “speak for hours” about all the things the Government is doing to fix the crisis but he said he’d mentioned the five main strands of the Government’s response to the crisis. He said Ireland will undergo the “biggest social housing programme in decades in Ireland” with “over 100,000” social houses to be provided over the next ten years and “8,000 this year alone”. 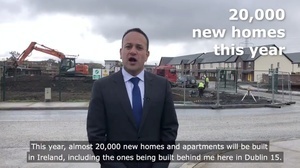 He said the Government is also “accelerating the supply of homes for people to buy” with 20,000 new houses and apartments to be built in Ireland this year and 25,000 next year. 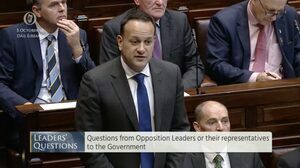 Mr Varadkar also mentioned how the Government brought in rent caps in urban areas to “put a stop to the spiralling double digit rent increases”. And he said “rough sleeping” is down by 40 per cent and “that didn’t happen by accident”. And, finally, he spoke about the recent launch of the Land Development Agency. 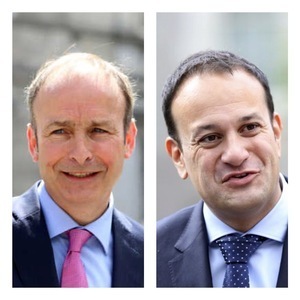 Posted in Misc and tagged Housing, Leo Varadkar, Micheál Martin at 12:39 pm on October 3, 2018 by Bodger. Actually Leo, you can speak for years but its actions that count, not another blithering, media friendly, soft focus case of you telling us you understand and feel our pain when you clearly don’t and most likely are incapable of normal human emotional reactions. Just go away. You have secured your EU position with your Brexit posturing. Ah well then, no need to do anything! To be fair, this situation didn’t happen overnight. This is the result of decades of bad planning in both the private and social housing sector and FF played their role in the creation of this situation. This won’t be something that can be fixed overnight. It is at boiling point now and it is important that we continue to put pressure on our politicians to execute rather than just pontificate to ensure that we are making our way out of this. FF ran the Shared Ownership scheme from 1991 – 2011. 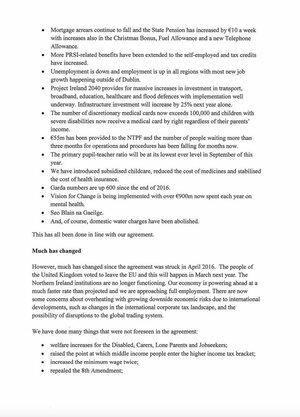 Fine Gael have done nothing. @Alan McGree – Deliberately, it would seem? The question is though, why? What deals did Noonan do with the vulture funds? How can we build 30,000-35,000 houses in the next 12 months? Take a piece of land you either own or intend to purchase, do a survey for stuff like power, sewerage, water etc., look at the local infrastructure, if all is OK hire some builders and they take it from there. Not sure what is difficult about that, it’s almost like they don’t actually want to…….but that’s just ridiculous, isn’t it? okay. so you skip the architecture step, and the planning step. That’ll shave 6 months off the build! Also you need credit to build these houses. 30,000 houses @100K each = €30 billion. Who is funding this? oh, and skip the objections to planning too… that can take years. In 2014 there were just over 11000 built apparently although this is disputed to be more in the region of 8.5k. In 2006 93000 units were built. So I would say that 20000 should be possible but given its already October it would be interesting to see where we are in relation to that…. I feel your pain, I really do and in response to that I am going to tell you exactly how I feel and what it means to me and to the people who are enduring this crisis. See, I could be Taoiseach! KellMA, why you trust the 2006 numbers and not the 2014 numbers? As far as I’m aware these were both based on ESB connections. Oh, I don’t prefer one over the other. Just the article referencing 2014 disputed them. The other one didn’t. Sure even if we use the same ratio it is still a huge amount of build that has been shown possible. That would be just over 71000 units. I’m saying that it’s not possible to build 70,000 units in 2019. If you look at the numbers from the late 1990s there was constant year-on-year increase. And if you look at the last 4 years there have been a year-on-year increase. But it takes time to scale things up. I’d love to know how many of the 93,000 2008 units were sold by, say, 2008. And how many of them (if any) are still empty. There were a lot of ghost estates in the middle of nowhere build back then. @ Cian. I agree. I was only trying to show it can be done and has been. You’re arguing that we can’t build large numbers next year as we haven’t been building in large enough numbers in recent years. That it takes time to scale things up. This is correct. But it absolves the government of their inaction for the last number of years. This crisis didn’t happen overnight, it hasn’t been ignored by all sections of society until recently. The warnings have been ignored by the government, for ideological reasons in my belief. This is unjustifiable and indefensible. We are where we are is an attitude that ignores who is to blame for the current status. Nothing makes me believe that actions on the ground will in any way reflect even the scant efforts that Leo claims his government will be undertaking in coming years. Varadkar is an empty suit. Its all spin! He is and it’s incredibly irritating. Our last 4 Taoisigh have all been spin and avoidance, smoke and daggers as one of them would say. Wanna go all out to last 6? Were John Bruton and Albert Reynolds any better? I don’t remember them as well due to foreign travel, alcohol & girls being of much more interest to me. Now that I’m older I find I can care about all those things and also politics. Was Charlie waffle? The “Living beyond our means” talk and all that. In the short term – the government should reduce the number of full-time short-term holiday rental (Air BnB) – either by an outright ban, or a licencing system, or a massive tax. Allow people to rent out their primary residence for up to 2 weeks (house swap) but stop landlords renting out their properties on AirBnB. in the short term, the government should legislate for ALL rentals to be leased through the local authority to those with a housing needs assessment, and the restrictions to being placed on a housing list should be abolished and open to all. it would ensure that everyone, from a vulture fund to a one-off, accidental landlord gets paid fair rent, which is not determined by ‘the market’. air bnb, as you rightly say should only be allowable for at most a few weeks per year on a primary residence only. Agreed. AirBNB is a scourge…..
What an incredibly mealy mouthed and disingenuous statement. 50% of these obscene rents go to government in tax. Tax from this stream has nearly doubled and yet, giving some of that back to renters would be too expensive? The Poshboy Landlord party doesn’t want lots of local authority housing because it will impinge on their profiteering through extortionate rents propped up by HAP for their slums.